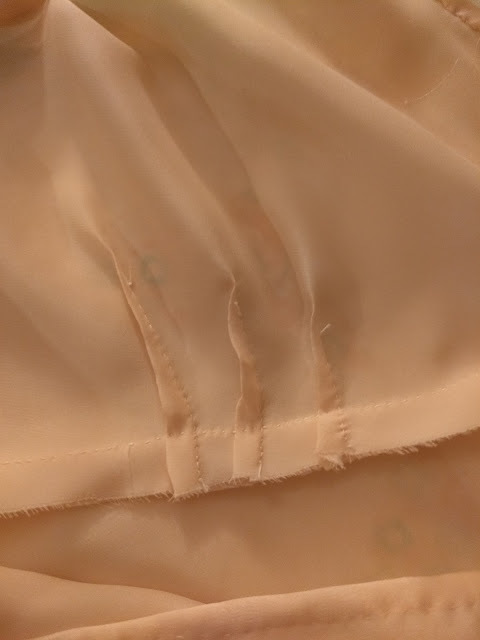 When I posted about my half-slip, I linked to some information about the Haslam System of Dresscutting but didn't really get into it. Let me rectify that now! The Haslam System is a method of creating patterns for anyone, at any size within a particular range. Where a paper pattern comes at full size in a range of set measurements, and a gridded pattern à la Janet Arnold comes in one particular size, Haslam patterns were printed to scale, roughly, with information on how to make them full size depending on an individual's measurements. The way this works is through the use of a two-sided chart. (The one at the link is prepared to be printed on A4 paper, so if you're American it will cut off some of the edges, but it's fixable.) Each side helps you draft the top of the back and front of a bodice sloper specific to any individual: the chart is perforated to allow you to plot points based on your neck, shoulder, and bust measurements, and on one side there are a few more to help you draft a sleeve. Then the printed pattern books show how to alter the sloper in order to turn a plain, fitted sheath into a stylish blouse, skirt, or dress - lengthen two inches to add fabric for tucks; cut a diagonal seam into the front; extend the center line into lapels and a facing. I'm making the finished patterns sound very basic, but if you browse through my Pinterest board of Haslam patterns at readable resolutions, you can see that they're just as varied as any other pattern company's offerings. This system was created by Grace Haslam of Bolton, England, in the 1920s. According to two newspaper articles that are literally the only sources I can find on her, Miss Haslam taught classes on it in her hometown and around the country throughout her life, teaching and publishing into the early 1960s - so nearly every vintage enthusiast will be able to find at least one or two patterns from her oeuvre to suit their taste. (Most likely her classes included dressmaking skills in general as well, since a) learning how to use the chart is very simple and wouldn't require more than one session, and b) these patterns don't include the kind of instructions we have today, with every technique used laid out in order.) As I noted above, the patterns are in no way basic: Grace visited London and Manchester and followed the fashion magazines in order to offer styles that looked just like ready-made clothing in the shops. The pattern books were printed off by a small staff at her home office and sent to anyone who'd taken her classes; relatively few survive, probably because her circulation was so small. There are a number of digitized copies on both eBay and Etsy, however. This slip was my first attempt at using the chart linked above and one of these scaled patterns: specifically, this one. As you can see, it departs from the usual "draft a bodice sloper and alter it" method, mostly involving drafting shapes based on bust/hip measurements. Please note! If you plan to try this one, where the bust piece says "cut and open", what it means is "cut and open at the bottom", because if you simply slash and spread the piece 1.5", as I did, the top edge will be wide and gappy and you'll need to pleat it down. As I did, as you can see. 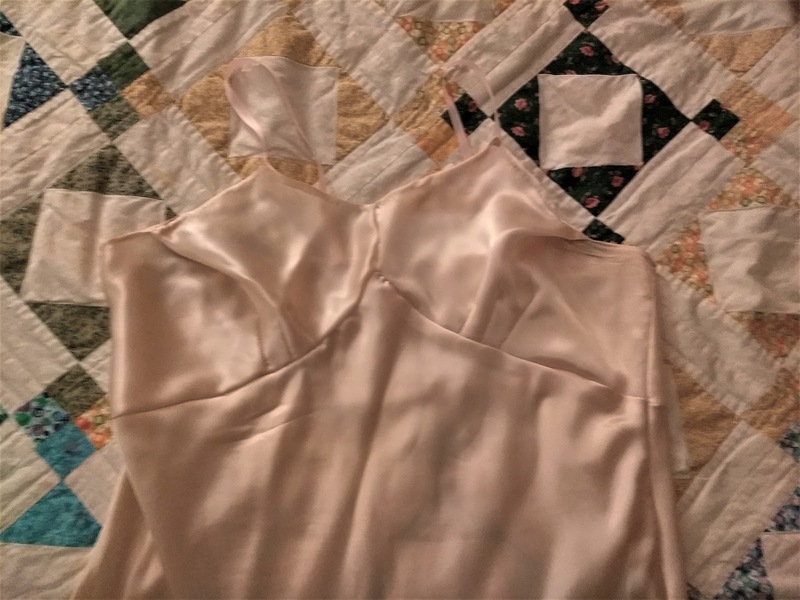 It's made out of the same champagne-colored silk charmeuse as my half-slip, and also sewn by hand with a very small running stitch. The side seams are French, with the initial run of stitching done more as basting because nobody has time for that. My order of operations, if you would like to replicate them, were to sew the two back pieces together, then the two bust pieces, which I then darted (possibly the fussiest part of the entire operation). Then I attached them to the lower front piece, and did the French side seams. After hemming the top, I attached ribbon straps, hemmed the bottom, and pleated up the excess fabric I mentioned earlier. All in all, it took me two days. If you were to use a sewing machine - mine has a heavy foot and isn't good with very lightweight fabrics - you could likely do it in one.